Anxiety, hypertension, elevated heart rates, interrupted sleep patterns and headaches are just some of the side effects commonly associated with energy drinks, and those problems are more pronounced in children, according to a recent University of Miami study. But that’s just the tip of the iceberg. These drinks have also been linked to heart palpitations, strokes and sudden death. 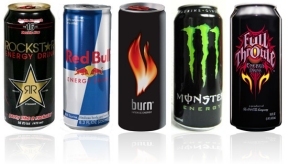 The term “energy” drink is an unfortunate misnomer, says food science expert Budge Collinson. They don’t give your body energy; they stimulate you with brief jolts of caffeine and unregulated herbal stimulants, he says. So, what are some ways kids can get a healthy energy boost? Collinson offers the following tips. • Go for a speedy bike ride together, take a brisk walk or hold foot-races in the yard. Numerous studies demonstrate the power of vigorous exercise in boosting energy. Exercise pumps more oxygen – pure, healthy fuel — into the bloodstream and to the brain and muscles for a short-term energy boost. Exercising regularly will increase lung capacity, so the body will gets more oxygen on a sustained level for the long term. Exercise also releases endorphins, the body’s natural feel-good chemical, which makes us feel happy. And happy people are energized people.